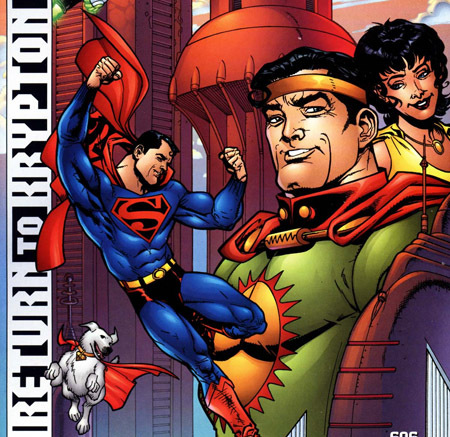 In the second "Return to Krypton" story, the one in which we learn the truth of this alternate, retro-Krypton and see it closed off forever, the Krytpo of that world is reunited with his former master Jor-El. 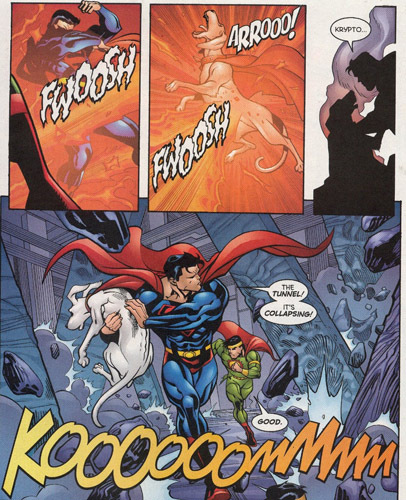 Things have gone belly up over there because of a Raoist cult and Superman is needed. 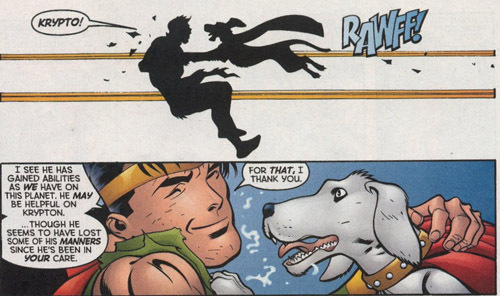 Well, it's not a bad time to give Krypto some exercise in his old stomping grounds either, so we're off to the Phantom Zone! 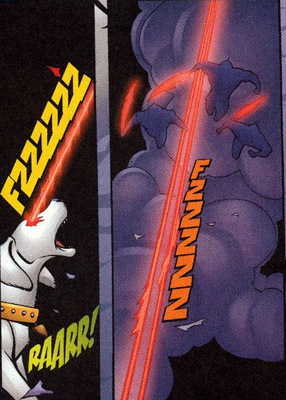 Almost immediately, the boys are under attack, and Krypto is the first to fire at the cloned super-soldiers of the enemy. 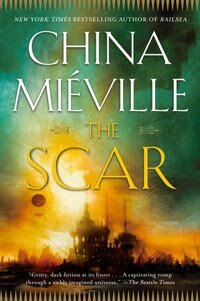 But their red sun flame swords sap the heroes of their powers and sting like the bejeezus! 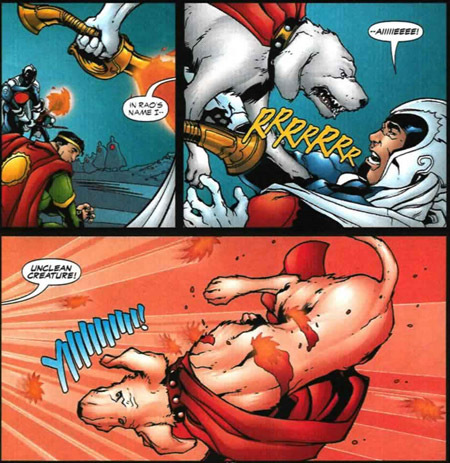 This is about the point when I started fearing for this version of Krypto. What if he's returning to Krypton for good? One last hurrah and then out of the Superman books. I don't want that. 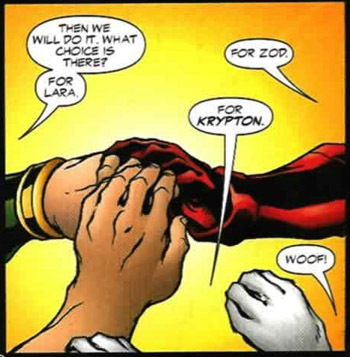 Later, though Krypto is told to stay behind, he joins in with an unholy alliance between the Els an Zod's minions. All for one and one for all against this more dangerous enemy. 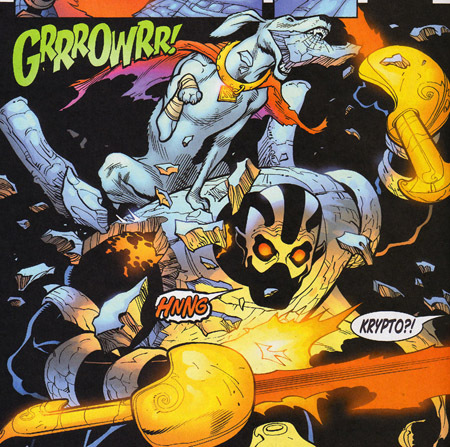 And indeed he does join the group, possibly coming dangerously close to expending all of his stored yellow sun energy just to get in on the action. 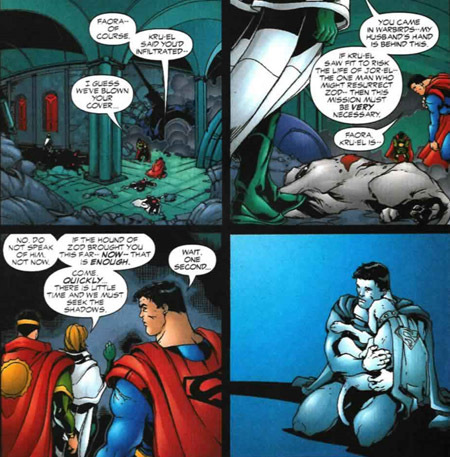 Superman's already pretty sapped at this point. Here it comes, the big battle with the clone army, and... OH NO! They've killed him! They're really killed him! Then, NO! He's ALIVE! I don't know who bandaged his leg, but he's on the main villain's back, chomping away! (And here I thought they'd use the cloning McGuffin to bring him back, if at all.) 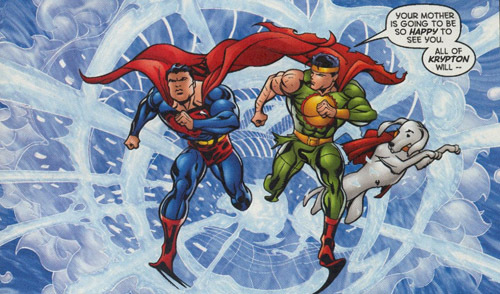 Well, Krypton is "fixed" and closed off, and Superman brings his pooch back over from the Phantom Zone, and I guess he'll stick around for a while longer.